I love making rice dishes but sometimes the rice gets dry and hard and my kids refuse to eat the meal. So I was so amazed to see you can make rice dishes just as easy as meat in Reynolds Oven Bags. I decided to make Chicken and Sausage Jambalaya recipe from Reynolds Kitchens Website using Reynolds Oven bags. You can find the recipe here. This is an amazing easy Chicken recipe that is baked in the oven. 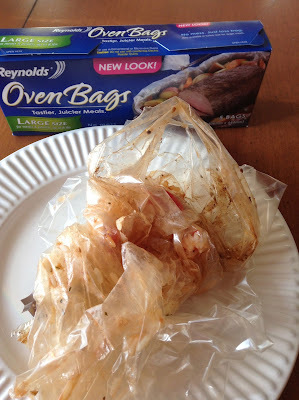 This is my first time using Reynolds Oven bags so this will be a learning experience for us both! Waking up feeling under the weather, I decided to do all the prep first thing, not knowing what the day was going to bring. (hopefully a long nap LOL) Half the work is done, just store your prepped bowls in the fridge until ready to prepare the Chicken and Sausage Jambalaya. About 40 minutes before dinner needs to be served, simply preheat your oven to 400 degrees and add all the ingredients to your Cooking bag per the directions. Make sure and use a baking dish that is 2 inches deep and can go into a hot oven. Also don’t skip the step of using flour in your bag first, this helps prevent burning. I also followed the directions exactly and purchased par-boiled rice. I have never used this before but it was easy to find in the rice section of my grocer. Once everything is added, just close the bag using the tie provided in the box. Make sure the opening is slightly to the side and the food is dispersed in an even layer in your pan to prevent uneven cooking. In just 35-40 minutes a meal complete with protein, rice and vegetables is ready to serve. This smells and tastes delicious. You can adjust the seasonings to fit your families tastes and tolerance for heat. This is a perfect meal to serve to guests too. More importantly look at what is left for cleanup. One dirty oven bag and a little residue in our pan. Dinner is served and this mom can take care of her cold knowing her family was fed a nutritious meal and there are no dishes to clean up!! This is a great quick and easy chicken recipe that can easily be done on a weekday even if you don’t have time to prep the food earlier in the day. They are for Conventional or Microwave use only. They are not to be used with Electric Roaster Ovens. Should follow instructions on box exactly. Must add 1 TBSP of flour to bag to prevent bag from bursting. Bag should be placed in a pan at least 2 inches deep. Bag should be closed with tie found inside package. Six 1/2-inch slits should be cut in top of bag to allow steam to escape. Ends of bag should be tucked in pan. When placing pan in oven, make sure you allow room for bag to expand during cooking without touching heating elements, walls or racks. Bag should not hang over pan. To serve – carefully cut open top of bag. Always support bag with pan. What do you cook in bags? This looks delicious; thanks for sharing with us. That’s a cool way to make jumbalaya. That looks really good! I tried the cooking bags once before, and really liked how juicy the meat was, and very easy clean up! Need to get them again! Great recipe and I love the idea of bags-NO mess!! I’ve never used cooking bags, but like the clean up for sure. Rice is not one of those foods I cook the whole way for some reason always a bit crunchy. thanks for sharing your recipe. Hope you are feeling better. I have never used oven bags but after reading your post I so have to start using them! Your Jambalaya looks wonderful! Thanks for the tips on using the cooking bags. I have a box of these bags from my dad’s home, but have never used them, mainly because I didn’t know what to cook in them other than a turkey! So thanks for this recipe! Not only does it sound delicious, but now I can try the bags! I’ve done a Turkey in a bag turned out so moist! I’d like to try and use this with salmon. Thank you for sharing. I appreciate it!